Summary: This sparsely populated area of northern England lies in Cumbria and became a new addition to the Yorkshire Dales following the National Park boundary extension in 2015. While it may be new to occasional walkers some of the features of this walk will be familiar to those who have completed Wainwright's Coast to Coast walk. 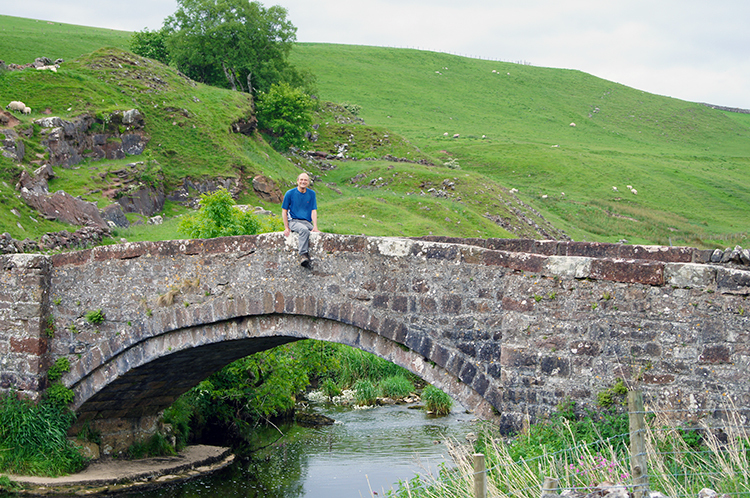 Smardale Bridge is a popular landmark on the route and a place of which I have fond memories. 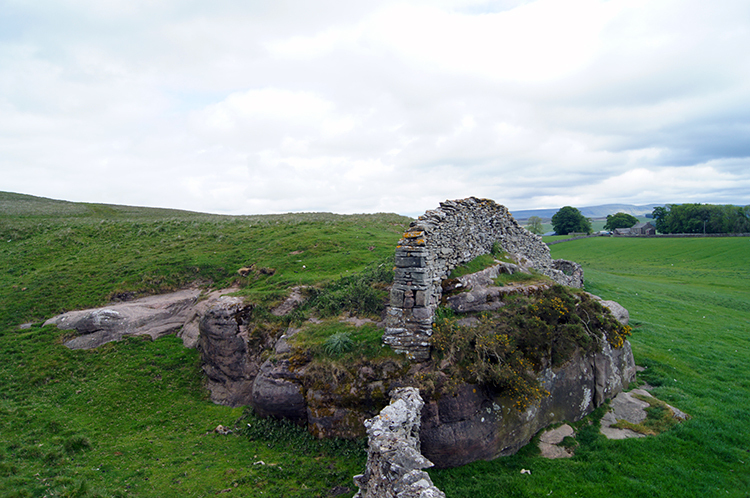 Indeed it was the bridge and the attractive countryside of Smardale in general which inspired the design of this walk. I hope you enjoy the environs of the walk as much as I do. My wife Lil and I were staying in Sedbergh for a few days as were friends Steve and Jan who had travelled up from Rugby. As is customary I had the task of designing the walks for the trip and I had no hesitation in picking this short half-day outing as the first one. Steve and I had fond memories of walking the Coast to Coast in 1994, of crossing Smardale Bridge and of staying at Bent's Farm during that walk. This walk would take us to the bridge and past the farm but a) I had not told him where we were going and b) as 22 years had passed since, it was not in his thoughts. I had just told him "this walk may evoke a few memories from your unconsciousness". And so we set off from Newbiggin-on-Lune on what I promised would be a nice and not too demanding walk for the girls while being a memory jogger for Steve. The first part of the walk was new to us all. Apart from the section we would be doing along the route of the Coast to Coast Path not one of us had walked these parts before. 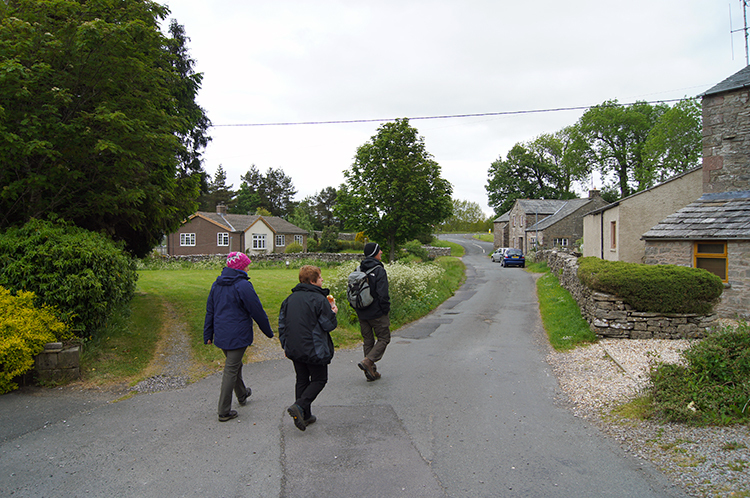 After leaving the village and crossing the A685 Kendal to Kirkby Stephen road which must be one of the quietest A roads in England we followed a side road which would dead-end at Badger Hill. 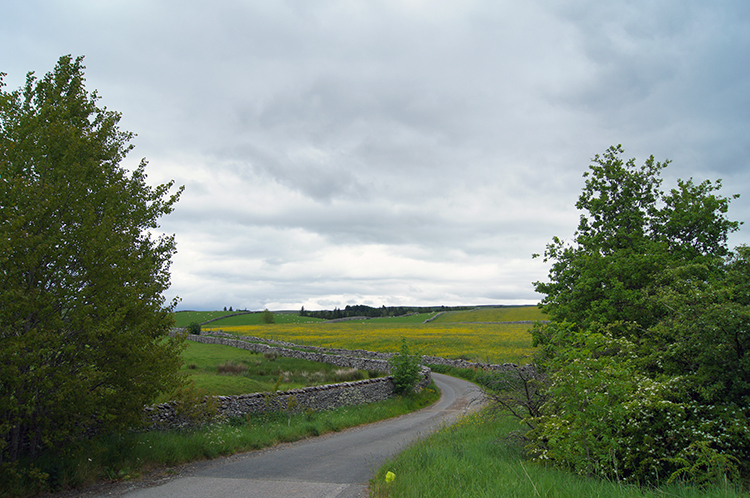 We left the road before its termination to cross a field which led us to Hag Mire. 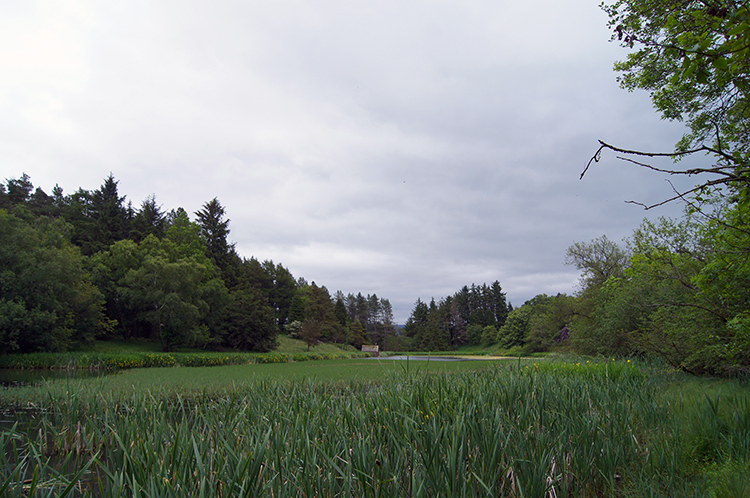 The mire is a tree-surrounded sheltered tarn which is probably used for private fishing. It was a quiet spot during our visit. Very still and spooky. We left Hag Mire to its peace while we interrupted ours to talk as we walked. There was a lot to catch up on. The talking while walking had seen us from Hag Mire across another field to the brow of Sandy Bank. 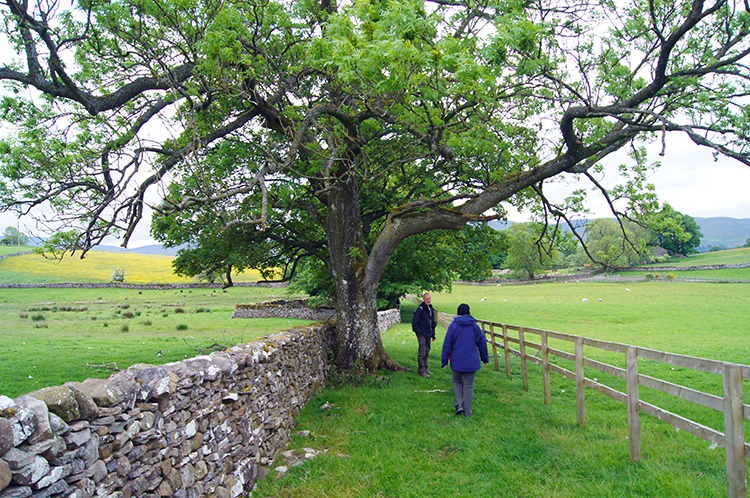 Around here we crossed a stile which led us from field onto a long bridleway leading down into Smardale. 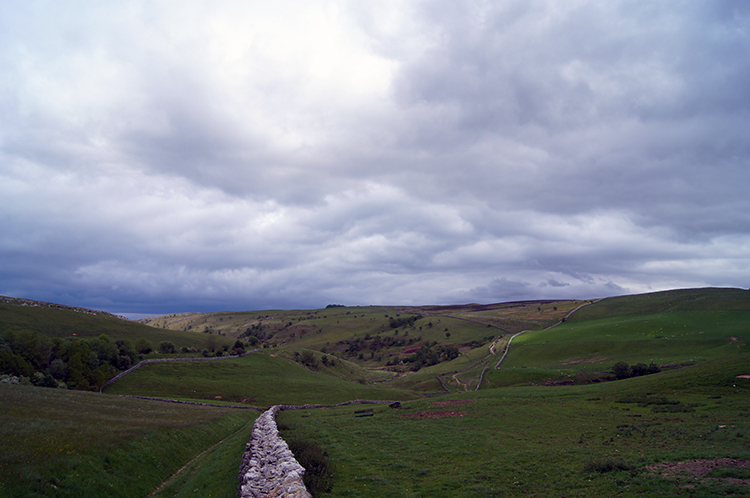 As we walked the dale opened out for us in all its glory. The remote beauty of Smardale was immediately evident and the sweeping curving course of the long dismantled railway line turning from southbound to westbound on the pivot of where Smardale Beck is joined by Severals Gill was in the centre of the picture right in front of us. 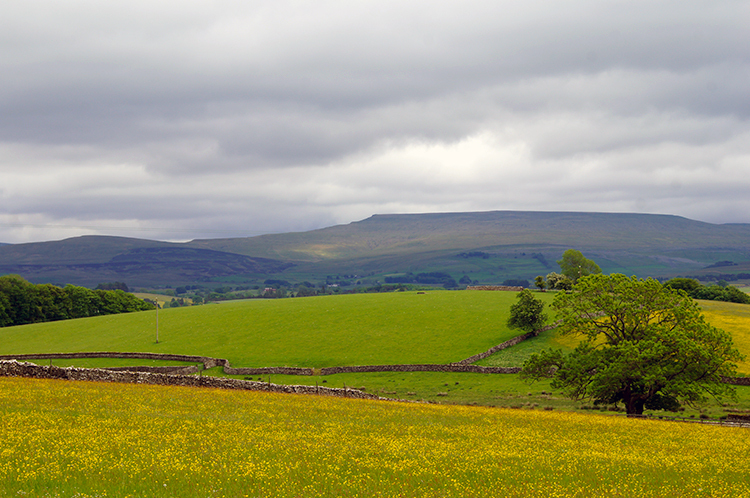 To the left of the picture was the bulk of Crosby Garrett Fell and to the right was the expanse of Smardale Fell. Paths lead across both fells though they seemed quiet. Admiring the scene as I walked I picked up the pace on descending to Smardale Bridge. I love that place and wanted to be there as soon as I could. My colleagues followed down in their good time. After the nostalgia and the fun of revisiting lovely Smardale Bridge we followed the path which Steve and I had last walked in the company of my brother Dave over 22 years earlier which took us up a bank, across a bridge over the disused railway line, past a quite impressive field barn and up along a wall side to scale Begin Hill. While it was familiar to us, if not entrenched in memory, we were now walking along the route of the Coast to Coast once more. And in the direction of east to west which we had taken that first time. So every step was as it was. And soon enough the affirmation that we were on the Coast to Coast Path was made as we met contemporary long distance walkers with heavily laden backpacks on the route. We wished them all well on their missions as we passed them by. 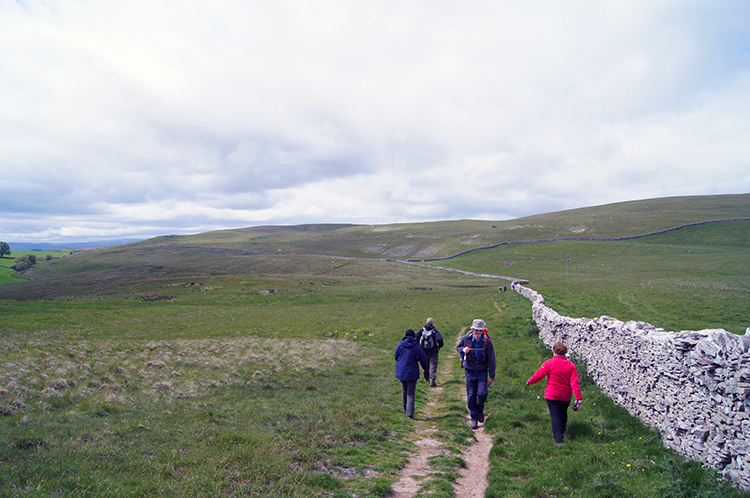 We met quite a few Coast to Coast walkers on the mile and a bit stretch of walking from Begin Hill to where we would leave the path on Great Ewe Fell. First we met a couple of ladies and then a solo man, all going from west to east. Then we met another solo male Coast to Coast walked heading east to west and this one was in great distress. He was walking slowly and as we caught him up he stopped and sat by a wall. With concern I asked "How are you doing". Indeed we all stopped to offer encouragement. He said "My knee is killing me. It aches so much and every step is agony" I could sympathise with that. I have been there before. I asked "How far have you to go today? He replied "To Shap but I will not make it. I am giving up and going to Ravenstonedale". He was inconsolable and asked to leave him while he rested before struggling in to his nominated finish. We did so but before leaving him Steve and I suggested he get to Ravenstonedale and rest the night before making a final decision. We told him that we had both been in his position and that after a night of rest and on occasion an extra day off the trail we had completed our walks as planned. 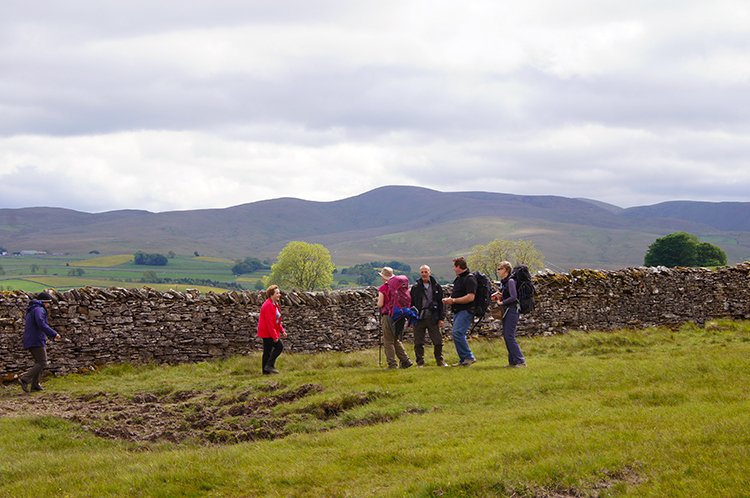 A little further along the way we met a group of four C2C walkers. They were in good spirits. After a little chat of greetings and compliments we asked them to try and motivate the chap we had just passed. After the series of meetings with long distance walkers we passed the path leading to Bent's Farm which caused Steve and I to recall our adventures of 1994. On that Coast to Coast walk Steve and Dave had camped in the garden of the farm while I indulged myself by staying in the farmhouse. Though I am always reminded of that event I did have my reasons for not tenting with them and they were sound ones. Steve knew that but still had to recall it. 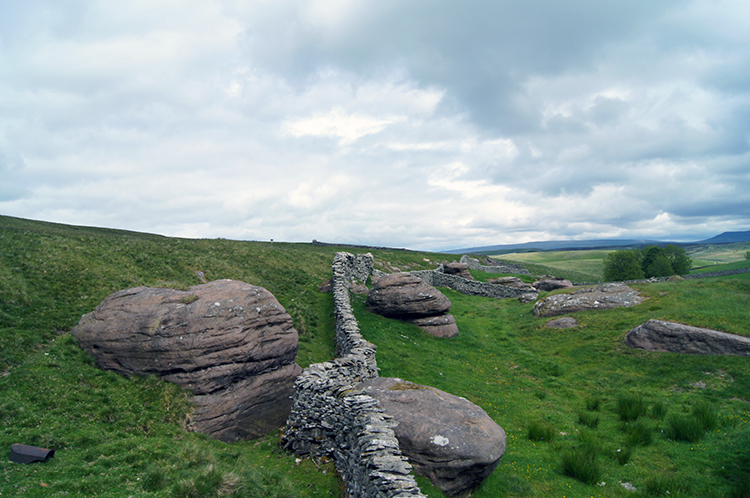 After the path which leads to Bent;s Farm gritstone outcrops surface from the fell. A drystone wall weaves its way between the stones though at one point it appears the drystone wall builder though again and decided 'why go around when it is easier to go over'. The result is quite an amusing sight. The views from this part of the Coast to Coast Path are superb, especially the view south across Lunedale and Ravenstonedale to the Howgill Fells. In the foreground were fields of yellow and green where Buttercup and Grass intermingled to create a lush carpet of colour. 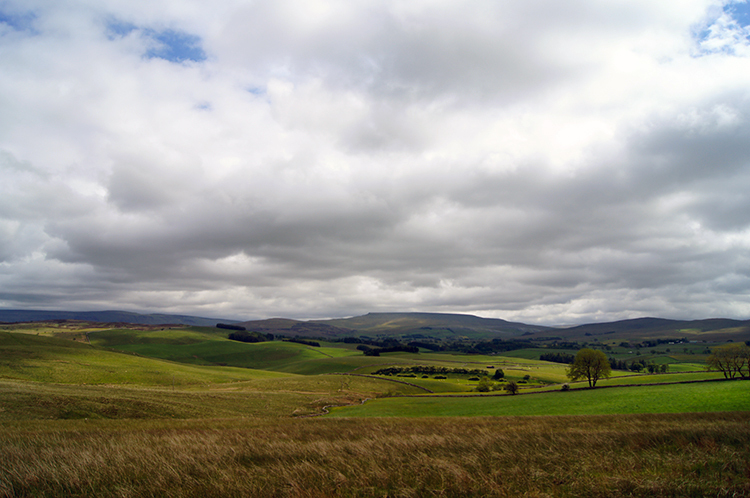 Beyond there were more lime green fields of early season grasses and grains and then in the backdrop the browns of the uplands and fells and they grey of a cloud filled sky. 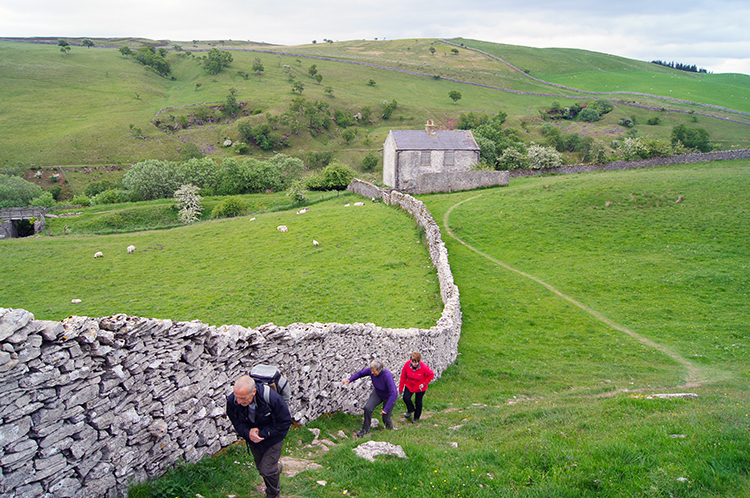 It was quite a sight which we enjoyed as we followed the Coast to Coast Path to Great Ewe Fell and then on our course back to Newbiggin-on-Lune via Intake and Brownber. At Intake we had to detour from the path across a field to a fenced path all the way around it. It appears the right of way has been moved by the landowners though there are no detour signs to say so. Best check before you come this way. After our forced detour at Intake, which to be fair was not a real encumbrancer, we followed a lane to Brownber where we came to a cottage with a garden full of carved wooden animals. A chap came to the garden gate as we passed and Lil complimented him on his work. I too admired it. We have plenty of animal carved in all manner of materials at home. 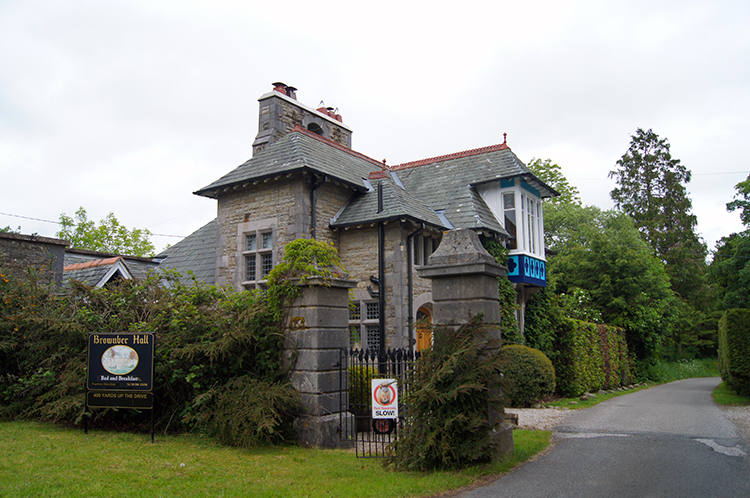 Soon after we came to Brownber Hall, now a hotel, and beyond back to Newbiggin-on-Lune. As we walked back into the village the sun came out to welcome us back. 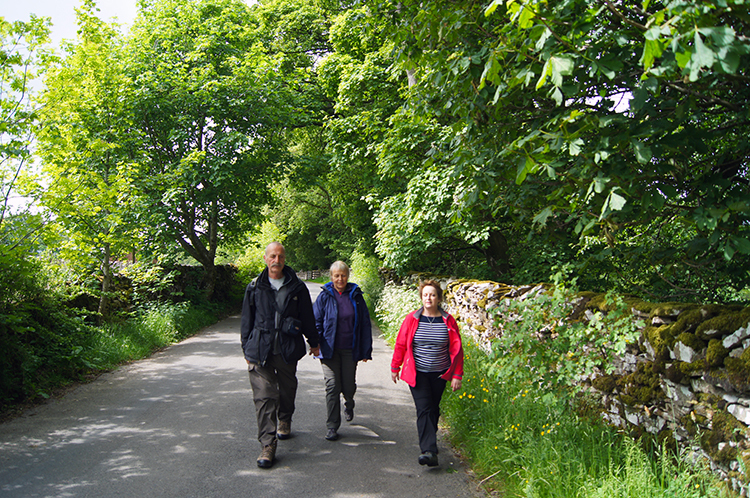 Smiles all round, on the kiss of sunshine and on reflection of a lovely walk done in a beautiful area of the bigger and better Yorkshire Dales.